JHAPA, June 25: Dhanamaya Thapa, a resident of Shivasatakshi Municipality, would always worry about her future as she has no formal education. Though peasant’s life would not attract her, she used to think that she had no options. However, her future had something else for her in store. Like her, other women in the village also wanted to do something other than working on their farms to earn a living. They decided to do something that would make them economically independent. These women approached Thapa for ideas to materialize their ambitions. Though Thapa was occupied in her household chores, she managed time to work with this group of women. They started meeting frequently, and brainstorming ideas for running a business. After a lot of discussions and brainstorming finally these women came up with an idea to start a joint venture that would give them better returns with less investment. We had to depend on our husbands even for a few rupees. Therefore, we all wanted do something that would help us earn, and that is where we thought about beekeeping. “We had to depend on our husbands even for a few rupees. We all had the same situation. And some members of our group were additionally blamed by their husband for not saving,” said Thapa. “So, we all wanted do something that would help us earn, and that is where we thought about beekeeping,” she added. That was 13 years ago. Now, their enterprise, Satakshi Mahila Mauripaalan Cooperative has over 500 members and is among the biggest bee farming cooperative in the district. “The journey was not easy. We had to struggle in the beginning,” she reminisced. “However, now our products are not only popular here but in other parts of the country as well,” she shared. When they started beekeeping in 2005, it was limited to the founding members of the group. After three years, they came together and started working in a house. The number of women working with the group for bee farming continued to grow constantly as they were able to sell the honey from the group members to cooperative easily. The cooperative collects honey from the farmers; processes it and sells it in the market. 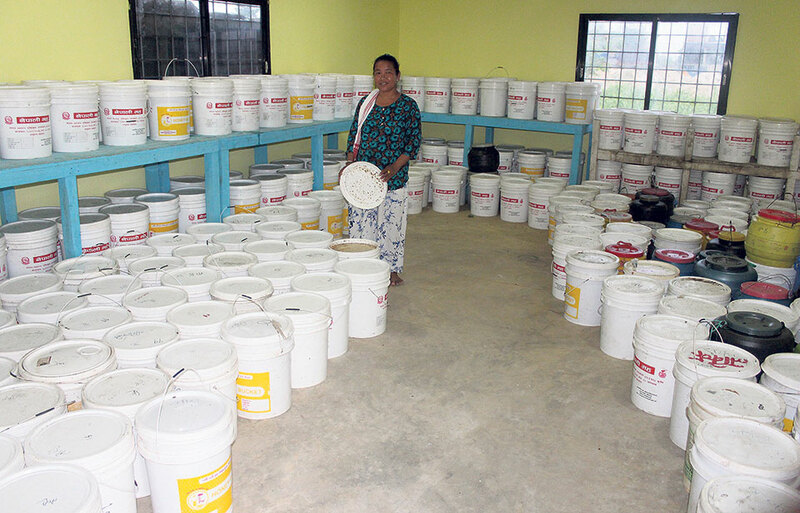 Another member of the cooperative Dhanamaya Thapa stated that the cooperative buys from them over 15,000 kilogram of honey annually. “Raw honey is purchased from farmers at the rate of Rs 400 per kg. The cooperative processes it and sells it in the market for around Rs 700 per kg,” she said. “Farmers do not face any hassle to find market for their production. There is always less production than the market demand,” Dhanamaya added. Before packing honey for selling in the market, it is sent to lab for testing. Once the department of Food Technology and Quality Control in Biratnagar certifies it, the honey is sent to market. Dhanamaya stated that honeybees do not bring poisonous nectar and bees that actually collect harmful nectar do not live in beehives. “However, we test all our produce before it is sent to the market to ensure the produce is aligns with the standards of the quality control department,” she said. The cooperative also invests in growing different types of crops and flowers for bees. The farmers let their bees in those locations. “The farmers here take their bees to Toribari of Morang, Lichhi garden or Sisaughari. When they can go to new place, bees seem to get excited. 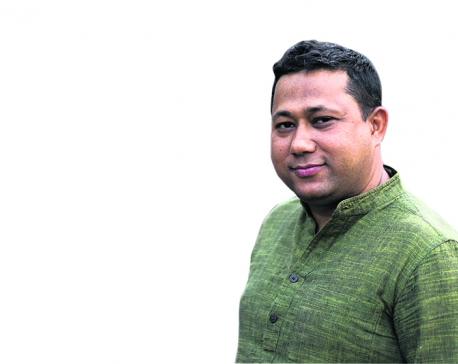 For a change, we take them to different locations,” Dhanamaya explained. Each of the women associated with the cooperative has 15 to 200 beehives each. Devi Dahal has 200, Tika Thapa has 100, Saru Dahal has 90 and Dhana Maya has 80 beehives. “Bee farming is comparatively an easy business,” says Saru Dahal. “We don’t have to devote too much of time or invest a lot. We should just be sincere,” she said. “Extreme hard working is needed when we take bees for ‘outing’ and when we collect honey. Rest of the time, we are free,” she added. To maintain the quality of honey, the women plan well before collecting it. They do it through teamwork. According Dahal, they work in team to ensure that the honey is collected appropriately without affecting the bees or the quality of the honey. “We help each other. We form a team and collect the honey. If you have to do it individually, it becomes way more difficult and even the quality cannot be ensured,” she added. When honey is collected in a team, there is least chance of adulteration. In addition, it is important for the farmers to ensure that all the honey sent to the cooperative is just pure. “No matter who does it, if quality comes under question, we all have to bear the brunt. Our honey will not get the same value. So, we have to work together for the good of all,” Dahal stated. Generally, honey can be collected from a beehive for around eight times in an year and such a beehive costs around Rs 10,000, Dahal informed.